Home → Blog → Turkish wines and fine Syrah. Turkish wines and fine Syrah. Stéphane Montez is a talented winemaker based in the Northern Rhône. I am a big fan of his inexpensive white and red wines, so I was delighted to receive a sample of the above wine, made from the oldest parcels of Syrah grown on granitic soils, and then aged in demi-muids for two years. St. Joseph generally offers great value for money, with plenty of really good red wines between €20-30. 2013 was a mixed vintage in the Northern Rhône, but I would have no hesitation buying this wine. Fragrant and elegant with very fine harmonious black cherry and damson fruits, this is ready to drink now although another year or two might improve it further. I Coravined (is that a verb?) my bottle and will return to it this weekend. Sadly the importer has sold out of this wine, but I understand both Redmond’s in Ranelagh and Green Man Wines in Terenure have it for sale at €36.95. In fine wine terms, this represents very good value. Carignan does not have a great reputation. In her book The Oxford Companion to Wine, Jancis Robinson says ‘it is high in everything – acidity, tannins, colour, bitterness – but finesse and charm.’ Yet this was once the most widely planted grape variety in the Languedoc-Roussillon, itself the biggest vineyard in the world. Why? Well because it gave a massive crop of grapes, which in a market not very interested in quality, meant economic success. Derided for years as barely drinkable, more recently a few producers have shown that old vines grown in good sites can produce amazingly good wine. Hence the Premium Old Vines title above. My own favourite is Domaine d’Aupilhac, available from the Wicklow Wine Company. The wine above is made from very ancient vines planted in the Roussillon, close to the Spanish border. It is deliciously simple and fruity, with a smooth finish. Perfect for large dinner parties where volume is required. Turkish Airlines held a wine tasting earlier this week. In fact it turned out to be more of a Christmas party for travel writers at the Turkish restaurant Keshk on Mespil Road. The food was very good. 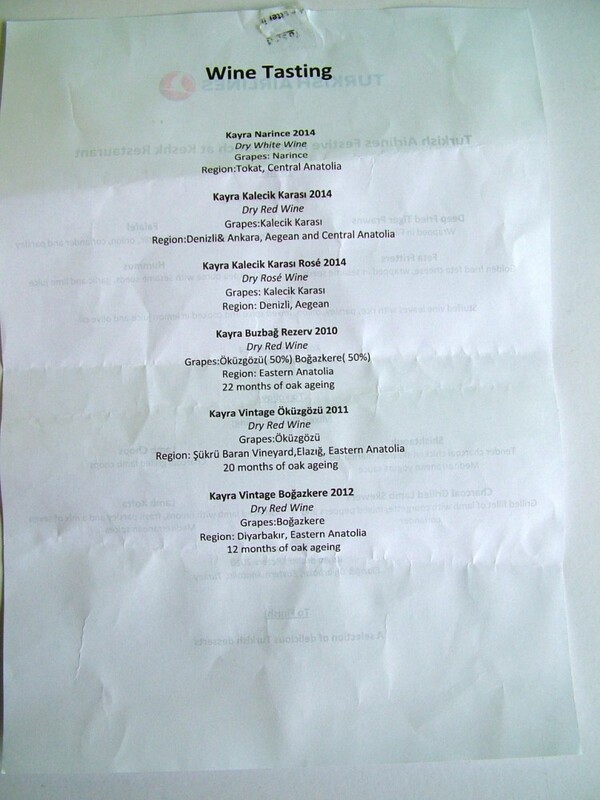 It was preceded by a somewhat hurried tasting and presentation by Gözdem Gürbüzatik of Kayra winery. I sat beside her over lunch and found her full of interesting information both on Turkish wines and the difficulties Turkey is going through at present. Who knew that Turkey is one of the world’s largest grape producers, but sadly only 2% goes into making wine? The rest become raisins or table grapes. Turkey vies with the U.S. to be the world’s largest producer of raisins. Thankfully Gürbüzatik decided to concentrate on indigenous Turkish varieties, leaving the Chardonnay, Viognier, Syrah and Cabernet for another time. Instead we tried Narince, Kalecik, Karsai, öküzgozü and Bogazkeri. We tried six wines, two of which I thought were very good, two ok and two falling into the ‘interesting’ category. Should they become available in Ireland I will certainly give more comprehensive notes on each wine. If you go to one of the resorts in Turkey this year, I would certainly try out the refreshing white Narince and reds made from Oküzgözü. Kayra seem a well-equipped modern producer with vineyards in several regions of Turkey. They even have a consultant winemaker called Daniel O’Donnell!